0 Comments Published by Matt on Tuesday, February 27, 2007 at 3:58 PM. The PocketMod is a new way to keep yourself organized. Lets face it, PDAs are too expensive and cumbersome, and organizers are bulky and hard to carry around. Nothing beats a folded up piece of paper. That is until now. With the PocketMod, you can carry around the days notes, keep them organized in any way you wish, then easily transfer the notes to your PDA, spreadsheet, or planner. Head on over, get organized and save $300. 0 Comments Published by Matt on at 3:49 PM. It would appear I haven't been doing a marvelous job at staying up to date with posting these days. 20 days since my last post about the DWR champagne chair design contest. I'm going to do my best to stay with it, but I'm finding that the cliche is true about planning a wedding - it takes up all your time! The good news is that Amanda & I are very close to deciding on a place and a date - stay tuned! I'm hoping to get a lot of stuff posted tonight including a rundown of last week's trip to Texas, including a recap of all the delicious vittles consumed, and links and videos aplenty from around the net. I'm about to go make muscles over at the gym and then back to work here to try to repair a server. 0 Comments Published by Matt on Wednesday, February 7, 2007 at 11:04 AM. Tis the season for Design Within Reach's annual Champagne Chair design contest. The finalist's have been announced, and you can now view the entries and vote here. In this contest, normal schmoes like you or design a miniature sitting chair using the components found at the top of a bottle of champagne. The results are astounding. 0 Comments Published by Matt on Thursday, February 1, 2007 at 3:47 PM. This site has a bot that looks at blogs all over the Internet every 10 minutes (!) for anyone who has written "I feel..." or " I am feeling.." and then adds that quote to the site. 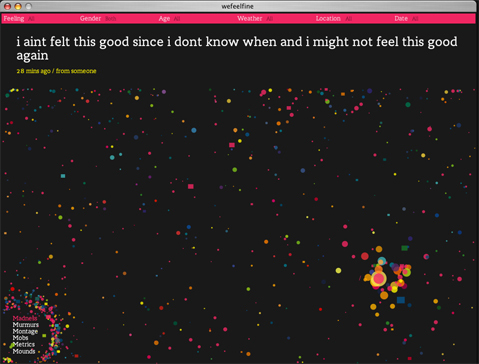 You then see all quotes floating in a crazy sea and can choose one at random. Each one of those little dots in the image is actually a quote lifted from the web. Also you can filter the results based on a few criteria (age, location, weather). It's a little abstract to explain here, but please go and have a look and find out how people are feeling. 0 Comments Published by Matt on at 1:47 PM. When I was eleven years old, I watched Live Aid in awe. I really have many memories from the concerts, but perhaps the most vivid is of Queen performing Radio Ga Ga at Wembly Arena. I have this image burned in my head of Freddie Mercury controlling the crowd as hundreds of thousand fans clapped their hands in unison. It was very powerful and even at that young age it thrilled me to see the power of music in action.